John F. Kennedy High School (JFKHS), formerly Tumon Senior-Junior High School, is a public secondary school located in the Tumon area of Tamuning in the United States Territory of Guam. 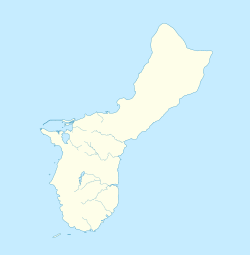 It is a part of the Guam Department of Education. The school, which opened in September 1959, serves Tamuning, Hagåtña, and portions of Dededo. John F. Kennedy High School was opened in September 1959 as "Tumon Junior-Senior High School". The first graduating class was from the same school year and graduated in 1960. In November 1962, Typhoon Karen, a category 5 typhoon, devastated Guam, leaving the only other public high school, George Washington High School (GWHS) without a campus. Following Typhoon Karen, GWHS held double sessions at John F. Kennedy High School. During 1962, John F. Kennedy High School's chapter of the National Honor Society was chartered. In 1964, Governor Manuel F.L. Guerrero signed Public Law 7-113, introduced by Senator J.U. Torres. This law renamed Tumon Junior-Senior High School "John F. Kennedy High School". Following enactment, the date of enactment was changed by Public Laws 7-124 and 7-125 to begin August 26, 1964. On August 26, 1965, Governor Guerrero signed Public Law 8-74, introduced by Senator George M. Bamba. This law appropriated $2,000 to design and erect a statue of President John F. Kennedy in front of John F. Kennedy High School. John F. Kennedy High School's Air Force Junior Reserve Officers Training Corps (AFJROTC) started at the school in 1970. In 1976, the Guam Community College began offering vocational training courses in nursing, marketing, and electronics through JFKHS. In June 2008 some of John F. Kennedy High School's buildings were declared unsafe, so for the school year 2008-2009, Kennedy students shared space with George Washington High School in double sessions. For the 2009-2010 school year, JFK moved into a facility in the Tiyan area of Barrigada. While other public high schools welcomed their students back on Tuesday, August 11, students at the John F. Kennedy high school interim at Tiyan were met with bad news after hearing that their school was delayed further after having large amounts of the chemical Chlordane in the soil and in the air. The students were able to finally arrive to school on August 24 after declaring the Chlordane levels in the air safe. Come on and fight, fight, fight for Kennedy High, Get up and raise your banners to the sky, We have a school of honor—brave and bold, And with our colors green and gold, so green and gold! Among the palms we'll have a jubilee, For Kennedy's the best school by the sea, We have the finest school, you'll all agree, all agree, It's Ken—ne—dy, Hey! During the 1999-2000 school year, the school had 2,400 students. 42% were Filipino, 37% were Chamorro, and the next largest groups Asians and other Pacific Islanders. Eugene, member of the Korean girl group, S.E.S. ^ "Progress Report Smaller Learning Communities Planning Grant." Guam Public School System. June 30, 2005. ^ a b c d e History. John F. Kennedy High School. Retrieved on September 1, 2009. ^ Guam Legislature. Public Law 7-113. Hagatna, 1964. ^ Guam Legislature. Public Law 7-124. Hagatna, 1964. ^ Guam Legislature. Public Law 7-125. Hagatna, 1964. ^ Guam Legislature. Public Law 8-74. Hagatna, 1965. ^ "John F. Kennedy High remains in limbo." Pacific Daily News. June 23, 2009. ^ Tamondong, Dionesis. "Pesticide found at JFK site: Concerns could delay classes at Tiyan facility[permanent dead link]." Pacific Daily News. August 8, 2009. Accessed September 1, 2009. ^ Staff. "BREAKING NEWS: Final chlordane test in soil done, interim JFK could open Monday[permanent dead link]." Pacific Daily News. August 21, 2009. Accessed September 1, 2009. ^ a b c d e f g John F. Kennedy High School. Accreditation History. Tumon, 2012. ^ John F. Kennedy High School. School fight song. Tumon, 2012. ^ "John Cruz biography". KUAM. 2016-06-30. Retrieved 2016-12-31. ^ KUAM, Michael San Nicolas, Hagatna, July 2012.